that Christian leaders of all ages and denominations need if they are to change themselves and their churches to reach out to the culture around them. Earl Creps,a popular speaker and leader,is director of the Doctor of Ministry program and associate professor at the Assemblies of God Theological Seminary (AGTS) in Springfield, Missouri. He has been a pastor, ministries consultant, and university professor. Along the way, Creps earned a Ph.D. in communication at Northwestern University and a doctor of ministry degree in leadership at AGTS. 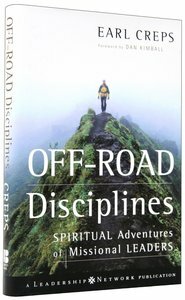 He has authored Off-Road disciplines and is preparing a title Reverse Mentoring, also he is currently leading a research project for a book on emerging culture, postmodernity and the Pentecostal church under funding from the Louisville Foundation. Dan Kimball is the author of several books including The Emerging Church and popular They Like Jesus But Not The Church (Zondervan). He is one of the pastors of Vintage Faith Church, a missional church planted for engaging the post-Christian culture in Santa Cruz, CA. He is currently pursuing a Doctor of Ministry from George Fox Evangelical Seminary where he also serves as Adjunct Faculty. Dan speaks extensively around the country on emerging church and culture issues as well as using the arts in worship. He serves on the editorial advisory boards for Youthworker Journal; Outreach Magazine and REV! Magazine. About Leadership Network. Foreword. Introduction: Off-road Disciplines. Part One: Personal Disciplines. 1. Death: The Discipline Of Personal Transformation. 2. Truth: The Discipline Of Sacred Realism. 3. Perspective: The Discipline Of Pov. 4. Learning: The Discipline Of Reverse Mentoring. 5. Witness: The Discipline Of Spiritual Friendship. 6. Humility: The Discipline Of Decreasing. Part Two: Organizational Disciplines. 7. Assessment: The Discipline Of Missional Efficiency. 8. Harmony: The Discipline Of Blending Differences. 9. Reflection: The Discipline Of Discernment. 10. Opportunity: The Discipline Of Making Room. 11. Sacrifice: The Discipline Of Surrendering Preferences. 12. Legacy: The Discipline Of Passing The Baton. Epilogue: Three Coffee Houses. Notes. Acknowledgments. The Author. Index.